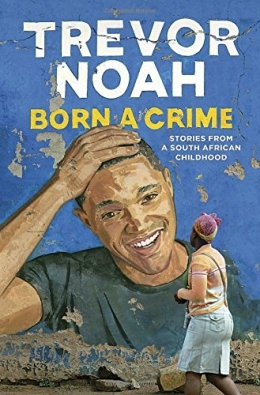 "The compelling, inspiring, and comically sublime story of one man's coming-of-age, set during the twilight of apartheid and the tumultuous days of freedom that followed." -- Amazon.com. Run -- Born a Crime -- Trevor, Pray -- Chameleon -- The Second Girl -- Loopholes -- Fufi -- Robert -- The Mulberry Tree -- A Young Man's Long, Awkward, Occasionally Tragic, and Frequently Humiliating Education in Affairs of the Heart, Part I: Valentine's Day -- Outsider -- A Young Man's Long, Awkward, Occasionally Tragic, and Frequently Humiliating Education in Affairs of the Heart, Part II: The Crush -- Colorblind -- A Young Man's Long, Awkward, Occasionally Tragic, and Frequently Humiliating Education in Affairs of the Heart, Part III: The Dance -- Go Hitler! -- The Cheese Boys -- The World Doesn't Love You -- My Mother's List. Xhosa (African people) -- Biography.